The latest developments to GE’s SF6 gas replacement for transmission equipment, g3, have got a lot of attention. To keep all stakeholders up to date and satisfy their curiosity, this article aims to respond to the numerous questions and comments that g3 continues to generate. The introduction of three g3-filled products (GIB, GIS and current transformers) at the CIGRE Session in August 2016 followed by the delivery and energization of the first equipment using g3 instead of SF6 raised considerable interests. Several questions and comments were transmitted to GE experts through the social media and the Think Grid feedback facility. Think Grid spoke with Philippe Ponchon, Executive Product Manager, Grid Solutions. In answering the different questions asked through social media, he provided further insights and some technical explanations that should be helpful to a wide spectrum of readers, and especially those with projects that are more environmentally driven to meet increasingly stringent regulatory requirements. What are the environmental advantages of g3? Philippe Ponchon: There is a major advantage – its global warming potential (GWP). SF6 is one of the six gases listed in the Kyoto Protocol due to its very high GWP, which is 23,500 times greater than CO2. So potentially, it has a heavy impact on climate change. g3 (a mixture of CO2, O2, and fluoronitrile called Novec™ 4710 developed by the 3M™ company) has a GWP lower than SF6. The reduction is even 99% when the difference in gas density is taken into consideration. Also, the lifetime of SF6 in the atmosphere is 3,200 years. This means that if 1 kilogram of SF6 leaks into the atmosphere today, there will still be 200 grams present in 5,000 years – that is, 165 human generations. And the amount of SF6 entering the atmosphere has been measured at an increase of 20% during the last five years. To illustrate the potential impact on climate change, it can be said that replacing SF6 by g3 in all high voltage equipment in the UK would be equivalent to taking 150,000 cars off the road! If equivalent results can be achieved under the same economic conditions, it is much more responsible to use a green solution. That is exactly what we have done with g3. What if the ambient temperature is lower than -25°C in AIS applications? Philippe Ponchon: We have developed g3 with our key markets in mind – GIS down to -25°C and AIS to -30°C – which represent some 90% of our marketplace. For these temperatures, we’ll be able to deliver g3-insulated GIS and AIS with the same footprint, the same performance and at similar or at slightly higher cost compared to SF6-based equipment (depending on the equipment type). There is still a possibility that g3 might be extended beyond the -30°C mark, but economic performance would be reduced, so developing g3 for this sector is not planned. For specific applications like dead-tank circuit breakers and operating temperature down to -40°C, g3 could be used with a heating belt to avoid liquefaction below -30°C (as is sometimes the case with SF6). g3 is a remarkable solution for mitigating the GWP disadvantages of SF6. Can you provide details of the electrical characteristics comparison between g3 and SF6? Philippe Ponchon: The important point to remember is that g3 can achieve the same electric performance as SF6 with a slightly higher gas pressure. What is the difference between the fluoronitrile used by GE and the fluoroketone used by the competition? Or are they both the same product by 3M with slightly changed properties? Are they based on 3M Novec 612? 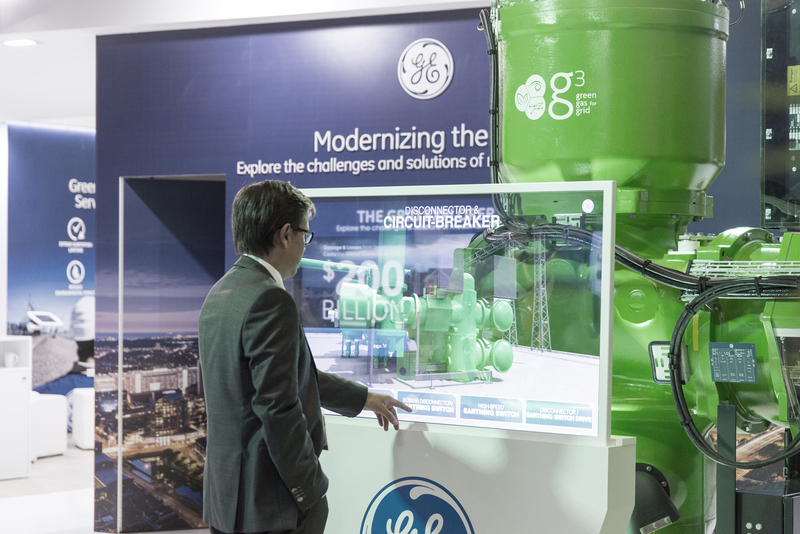 Philippe Ponchon: The GE solution, g3, is based on CO2, O2 and Novec 4710, a fluoronitrile that offers the benefits of high dielectric strength and a low boiling point. The competitor solution for high voltage applications, as publicly disclosed, is based on CO2, O2 and Novec 5110, which is C5-FK, a fluoroketone. The GE solution has the advantage of being applicable for minimum operating temperatures down to -30°C for AIS and -25°C for GIS. It is therefore suitable for both indoor and outdoor operation. The fluoroketone solution is limited to temperatures down to 0°C and consequently to indoor application. This is important to our customers who want to cover all their needs with a single standard solution. Note also that thanks to the high dielectric strength of fluoronitrile, the GE solution is a g3-insulated product with the same footprint for the same performance. This is not the case with other solutions. The Novec 612 mentioned in the question is something quite different; it is another fluoroketone with a boiling point of +49°C, which means it would quickly liquefy in HV equipment. Novec 612 is used to replace SF6 in the magnesium casting process. Is retrofit by gas replacement in existing GE switchgear and gas-insulated lines possible? Philippe Ponchon: Direct retrofit is not possible. However, retrofit could be possible in some specific cases, though not with strictly identical performance or operating conditions. In any case, equipment modification will be necessary. Due to the differences of the gas characteristics between g3 and SF6, the design of today’s circuit breakers needs to be adapted to the new gas mixture, and then they must undergo intensive type tests. It is therefore not possible to simply replace SF6 by g3 in circuit breakers. As far as gas-insulated lines are concerned, retrofit could be considered on a case-by-case evaluation with different operating conditions and equipment modifications. How do g3 and SF6 behave in a short circuit, at a high temperature and under high pressure, and what decomposition products result? Philippe Ponchon: Overall, g3 is equivalent to the current SF6 solution in these respects. g3 has been proven to be very stable at high temperature and high pressure. When subjected to an electrical arc, decomposition by-products are generated. These mainly come from the CO2 in the g3 gas mixture. As regards toxicity of the by-products, comparative tests have been performed with g3 and SF6 during interruption within the circuit breaker. The by-products have been analyzed by independent pharmaceutical laboratories and by-products from arcing in g3 are in the same toxicity class as those generated by SF6 under the same conditions. What happens in case of a leakage in a substation? Are the new and aged gases toxic? The leakage rates with g3 will be equivalent to the leakage rates with SF6 thanks to specific gaskets with adapted design and material. Since g3 is qualified nontoxic and aged g3 is in the same toxicity class as polluted SF6, i.e., nontoxic in normal operating conditions, the same procedures must be used in case of leakage in a substation as with SF6. In case of a small leakage, reduction of oxygen levels must be checked to avoid suffocation. Both Novec 4710 and CO2 have, like SF6, their own occupational limits for workers and they must not be exceeded. For both Novec 4710 and CO2, detectors are available on the market. In case of a pressure release device opening and the subsequent release of polluted g3, the substation must first be ventilated to remove polluted gases and workers must wear appropriate autonomous breathing equipment, as is the case with heavily polluted SF6 today. Currently, how do manufacturers work with g3 in GIS and circuit breakers? Philippe Ponchon: g3 is GE’s solution to replace SF6. It is made up of three components, CO2, Novec 4710 and O2. Both GE and 3M recognize the sustainable nature of the Novec 4710 dielectric fluid and as such are supportive of offering this material to a broader audience. An example is the cooperation with LSIS in South Korea to jointly develop SF6-free power equipment. GE benefits from being the first company to work with Novec 4710. As greenhouse gas regulations become ever more stringent, so the demand for alternatives such as g3 will increase. Do you want to try any test sites for replacing SF6 with g3? I have some 34 kV GE circuit breakers that may be a good platform. Philippe Ponchon: It must be remembered that we initiated research into an SF6 replacement as AREVA T&D. Later, the business was acquired by Alstom, the latter being dedicated to high voltage, with no medium voltage switchgear activity. Work on g3 for medium voltage was discontinued at that time, allowing us to focus entirely on the high voltage sector. Furthermore, alternative technologies for medium voltage exist, such as dry air for insulation and vacuum for circuit breakers. Can g3 be applied to railroad electrification applications – 15 kV, 25 kV, 50 Hz. Are there any plans to develop a technology demonstrator for this market? Philippe Ponchon: The railroad electrification sector is not a priority for g3 development, so there is no application available today. Our initial focus covers high voltage equipment for voltages above 50 kV, more specifically 145 kV, 245 kV and 420 kV. At CIGRE 2016, we introduced the 420 kV GIL, 145 kV GIS and a 245-kV current transformer. Further products will be developed in accordance with the market demand. We observe a growing interest for 420 kV GIS. We will further develop the GIS range at other voltage levels as well as the current transformer range, moving then to the air-insulated live-tank and dead-tank circuit breakers. What other potential applications exist? Philippe Ponchon: g3 is a gas mixture designed for HV switchgear. One of its components is a fluoronitrile, which could be considered as a replacement for SF6 in other applications such as special manufacturing processes (especially the magnesium industry), radar, laser and military applications that are out of GE Power’s Grid Solutions’ portfolio. GE and the GE monogram are trademarks of General Electric Company. 3M and Novec are trademarks of the 3M Company. GE reserves the right to make changes to specifications of products described at any time without notice and without obligation to notify any person of such changes. © Copyright 2018, General Electric Company. All rights reserved.